The church: St Ann of the Dunes, Beverly Shores, Indiana, USA. The building: The building is a modest 60s concrete block structure set in some donated wooded acreage in the Indiana Dunes. 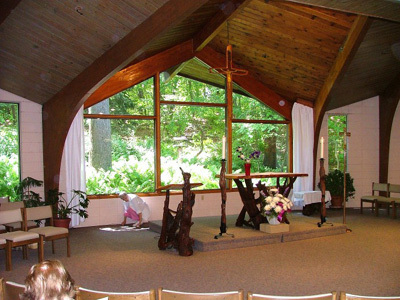 The altar area has wood beams and ceiling, with windows looking out into the woods. Nature is the altarpiece. A bird feeder (popular with what looked to be blue jays on this day) provided a pleasant distraction. The church: The parish seems very healthy, with a combination of year-round residents and weekend visitors. The congregation included lots of children, who were a bit of a distraction as there appeared to be no separate child care during mass. The parishioners were of a wide range of ages. The neighborhood: For 10,000 years, nature's elements have combined to make the Indiana Dunes a place like no other on earth. The area's long sandy beaches, dunes, forests, marshes and bogs are home to a rich variety of plants and animals. Beverly Shores is a lakeside resort town on the south shore of Lake Michigan. The town is less exclusive than some of the gated communities along this stretch but is quite a bit more affluent than some larger cities nearby. The cast: The celebrant was the Rev. Charles E. Doyle, pastor emeritus. Father Doyle was assisted by Mrs. Judy Guriel, organist, and Mrs. Patricia Babcock, sacristan. Corpus Christi Sunday, 10:00am mass. About seven-eighths full – maybe 200 people. An usher was handing out the parish newsletter and bade us a good morning. They were new-ish linked wooden chairs with upholstered seat and back. Nice, but no kneelers. Kneeling seems to have fallen out of vogue in many American Catholic churches. Lots of chatter and the commotion of youngsters. "Good morning everyone! I'm Father Charles Doyle, pastor emeritus." A paperback missalette and a song book enclosed in a binder. An electronic organ with faux pipes. There was a group of folks in a section near the organ who appeared to be singing more purposefully than the rest of the congregation. This may have been the choir, but they didn't really do any music by themselves so I wan't sure. A song leader sang the verses of the psalm and gospel acclamation. The music. In a rather lively parish like this it would seem appropriate to invest more in music and worship. I found myself waiting expectantly for the organist to play an occasional correct note on the pedals. The singing was best during the Lord's Prayer, but otherwise really quite bad. Only the first couple of verses of the hymns were deemed worth the struggle. Also the children were about as fidgety as they could be, shy of being totally out of control. Somewhat happy but not clappy. It was a fairly standard Catholic mass, so very low church. The congregation engaged in the practice of joining hands during the singing of the Lord's Prayer, which can be a warm and moving touch if you don't feel forced to participate. The petitions were of the "chime in with your own" variety, and I was pleased to hear about 30 petitions put forth by various members of the congregation. Nice. 7  Father Doyle began his association with St Ann's in 1968 and all the regulars regard him as a much-loved figure. He appeared to have some difficulty reading his notes and seemed to this mass-goer to be frustrated by some disability (perhaps the result of a mild stroke?). But he preached very effectively. The readings were about manna in the desert. Father drew a parallel between this and Jesus as the Bread of life. God forgives the repentant sinner, even the likes of a convicted murderer. Father serves as a prison chaplain and described being present at the execution of the convicted killer Gary Scott, whose sentence was not stayed even so that Scott could donate his liver to a needy recipient (his sister). A strong advocacy was made for the group Call to Action, whose tenets include optional celibacy for priests, ordination of women, amnesty for divorced and separated Catholics, full recognition of gays and lesbians within the church, etc. The hierarchy have distanced themselves from this organization, and yet here at mass the people were being encouraged to involve themselves in the group's causes and to sign a petition on its behalf. The music and liturgy were so minimal and awkward that the service felt makeshift. I was more enthralled by the fidgety children than I was by the mass. A proper hymnal and a service sheet including the responses would help, along with professional musical leadership that includes taking time to teach the people to sing. Graduates (high school and others) were being honored, so there was a large sheet cake set out on a table in the rear of the seating area. The graduates were asked to stand and were applauded. People were chatty in the cake line. My party and I all signed the petition for Call to Action. The offerings of coffee, juice and cookies were quite acceptable, although I'm sure they don't serve graduation cake every week. 6  If I had a weekend house in the Dunes (as a friend of mine does) I would consider it. Sure. The service had its strengths even if liturgy and music weren't among them. Father Doyle's mentioning his personal support for Call to Action and adding that he was hoping to meet a rich widow who shared his views.